There’s a lot going on! Here’s a news roundup. I will separately talk about what the Azimuth Climate Data Backup Project is doing. I’ll start with the bad news, and then go on to some good news. • Brian Kahn, Behold the “tweaks” Trump has made to the EPA website (so far), National Resources Defense Council blog, 3 February 2017. There’s more about “adaptation” to climate change, and less about how it’s caused by carbon emissions. • Joe Davidson, Trump transition leader’s goal is two-thirds cut in EPA employees, Washington Post, 30 January 2017. • Sara Reardon, US government takes animal-welfare data offline, Nature Breaking News, 3 Feburary 2017. • Abraham Gutman, Scott Burris, and the Temple University Center for Public Health Law Research, Where will data take the Trump administration on housing?, Philly.com, 1 February 2017. Or, work with EDGI to organize one your own data rescue event! They provide some online tools to help download data. • Environmental Data and Governance Initiative. • Tabitha Powledge, The gag reflex: Trump info shutdowns at US science agencies, especially EPA, 27 January 2017. NeuroDojo Zen Faulkes posted on how to demand that scientific societies show some backbone. “Ask yourself: “Have my professional societies done anything more political than say, ‘Please don’t cut funding?’” Will they fight?,” he asked. Taking a cue from how the Women’s March did its social media organizing, other scientists who want to set up a Washington march of their own have put together a closed Facebook group that claims more than 600,000 members, Kate Sheridan writes at STAT. The #ScienceMarch Twitter feed says a date for the march will be posted in a few days. [The march will be on 22 April 2017.] The group also plans to release tools to help people interested in local marches coordinate their efforts and avoid duplication. Among other political activities, it is holding a webinar on Pi Day—March 14—to explain to scientists how to run for office. Yong calls 314Action the science version of Emily’s List, which helps pro-choice candidates run for office. 314Action says it is ready to connect potential candidate scientists with mentors—and donors. Other groups may be willing to step in when government agencies wimp out. A few days before the Inauguration, the Centers for Disease Control and Prevention abruptly and with no explanation cancelled a 3-day meeting on the health effects of climate change scheduled for February. Scientists told Ars Technica’s Beth Mole that CDC has a history of running away from politicized issues. One of the conference organizers from the American Public Health Association was quoted as saying nobody told the organizers to cancel. I believe it. Just one more example of the chilling effect on global warming. In politics, once the Dear Leader’s wishes are known, some hirelings will rush to gratify them without being asked. The APHA guy said they simply wanted to head off a potential last-minute cancellation. Yeah, I guess an anticipatory pre-cancellation would do that. But then—Al Gore to the rescue! He is joining with a number of health groups—including the American Public Health Association—to hold a one-day meeting on the topic Feb 16 at the Carter Center in Atlanta, CDC’s home base. Vox’s Julia Belluz reports that it is not clear whether CDC officials will be part of the Gore rescue event. • Jennifer A Dlouhy, Fearing Trump data purge, environmentalists push to get records, BloombergMarkets, 13 January 2017. U.S. government scientists frantically copying climate data they fear will disappear under the Trump administration may get extra time to safeguard the information, courtesy of a novel legal bid by the Sierra Club. The environmental group is turning to open records requests to protect the resources and keep them from being deleted or made inaccessible, beginning with information housed at the Environmental Protection Agency and the Department of Energy. On Thursday [January 9th], the organization filed Freedom of Information Act requests asking those agencies to turn over a slew of records, including data on greenhouse gas emissions, traditional air pollution and power plants. The rationale is simple: Federal laws and regulations generally block government agencies from destroying files that are being considered for release. Even if the Sierra Club’s FOIA requests are later rejected, the record-seeking alone could prevent files from being zapped quickly. And if the records are released, they could be stored independently on non-government computer servers, accessible even if other versions go offline. The program implements a mathematical model that runs in discrete time. It has two stable states, and is driven by a combination of a sine forcing function and a noise source. The code builds on top of a library called JSXGraph, which supports function plotting, interactive graphics, and data visualization. If you haven’t already, go try the program. On one plot it shows a sine wave, called the forcing signal, and a chaotic time-series, called the output signal. There are four sliders, which we’ll call Amplitude, Frequency, Noise and Sample-Path. • The Amplitude and Frequency sliders control the sine wave. Try them out. • The output signal depends, in a complex way, on the sine wave. Vary Amplitude and Frequency to see how they affect the output signal. • The amount of randomization involved in the process is controlled by the Noise slider. Verify this. • Change the Sample-Path slider to alter the sequence of random numbers that are fed to the process. This will cause a different instance of the process to be displayed. Time to look at the blueprints. It’s easy. • Open the model web page. The code is now running in your browser. • While there, run your browser’s view-source function. For Firefox on the Mac, click Apple-U. For Firefox on the PC, click Ctrl-U. • You should see the html file for the web page itself. The first one loads MathJax, which is a formula-rendering engine. Next comes JSXGraph, a library that provides support for plotting and interactive graphics. Next, StochchasticResonanceEuler.js is the main code for the model, and finally, normals.js provides random numbers. • In the source window, click on the link for StochasticResonanceEuler.js — and you’ve reached the source! The program implements a stochastic difference equation, which defines the changes in the output signal as a function of its current value and a random noise value. A simulation loop, which renders the output signal. The program contains seven functions. The top-level function is initCharts. It dispatches to initControls, which builds the sliders, and initSrBoard, which builds the curve objects for the forcing function and the output signal (called “position curve” in the program). 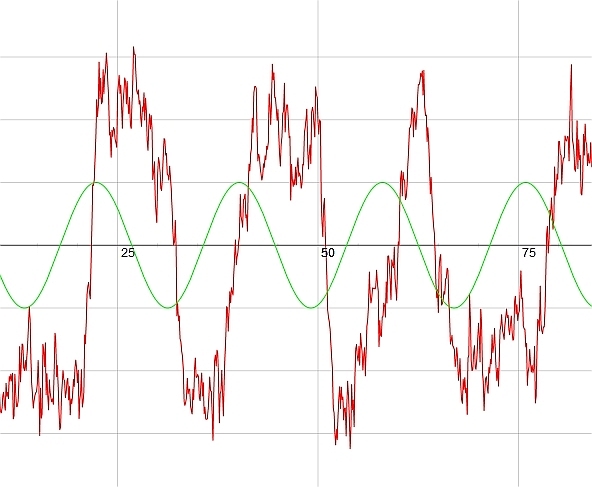 Each curve object is assigned a function that computes the (x,t) values for the time series, which gets called whenever the input parameters change. The function that is assigned to the forcing curve computes the sine wave, and reads the amplitude and frequency values from the sliders. (t + tStep, x + tStep * Deriv(t,x) + noiseSample). The current point is initialized to (t0,x0), and then the stepper is repeatedly applied to the current point and the current noise sample. The output returned is the sequence of (t,x) values. The noise samples are normally distributed random numbers stored in an array. They get scaled by the noise amplitude when they are used. The array contains more values than are needed. By changing the starting point in the array, different instances of the process are obtained. Now let’s tweak the program to do new things. First let’s make a local copy of the program on your local machine, and get it to run there. Make a directory, say /Users/macbookpro/stochres. Open the html file in the view source window. Paste it into the file /Users/macbookpro/stochres/stochres.html. Next, in the view source window, click on the link to StochasticResonanceEuler.js. Paste the text into /Users/macbookpro/stochres/StochasticResonanceEuler.js. Now let’s get warmed up with some bite-sized programming exercises. Change the color of the sine wave. Change the exponent in the bistable polynomial to values other than 2, to see how this affects the output. Add an integer-valued slider to control this exponent. Modify the program to perform two runs of the process, and show the output signals in different colors. Modify it to perform ten runs, and change the output signal to display the point-wise average of these ten runs. Add an input slider to control the number of runs. Add another plot, which shows the standard deviation of the output signals, at each point in time. Replace the precomputed array of normally distributed random numbers with a run-time computation that uses a random number generator. Use the Sample-Path slider to seed the random number generator. When the sliders are moved, explain the flow of events that causes the recalculation to take place. What is the impact of the frequency of the forcing signal on its transmission through stochastic resonance? • Make a hypothesis about the relationship. • Check your hypothesis by varying the Frequency slider. • Write a function to measure the strength of the output signal at the forcing frequency. Let sinwave be a discretely sampled sine wave at the forcing frequency, and coswave be a discretely sampled cosine wave. Let sindot = the dot product of sinwave and the output signal, and similarly for cosdot. Then the power measure is sindot2 + cosdot2. • Modify the program to perform N trials at each frequency over some specified range of frequency, and measure the average power over all the N trials. Plot the power as a function of frequency. • The above plot required you to fix a wave amplitude and noise level. Choose five different noise levels, and plot the five curves in one figure. Choose your noise levels in order to explore the range of qualitative behaviors. • Produce several versions of this five-curve plot, one for each sine amplitude. Again, choose your amplitudes in order to explore the range of qualitative behaviors.